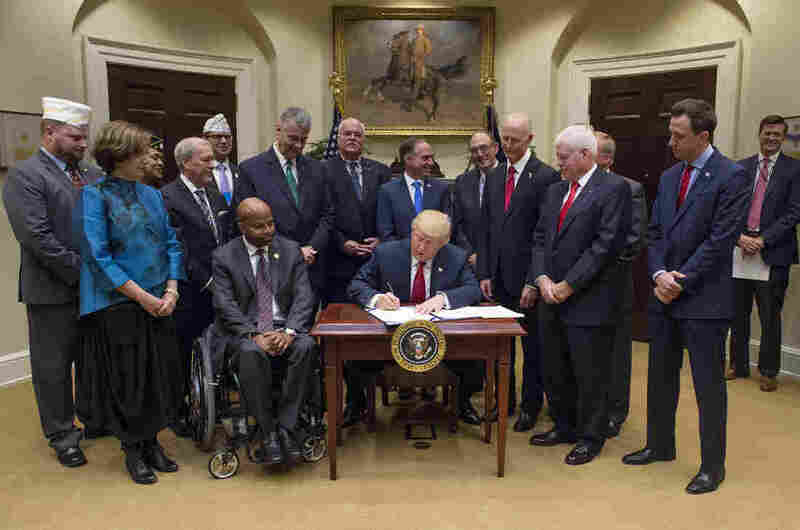 Trump Signs Extension Of Troubled VA Program : Shots - Health News The Veterans Choice program was supposed to make it quicker and easier for vets to see a doctor by paying for private-sector care. But it's ended up being slower and more complicated. 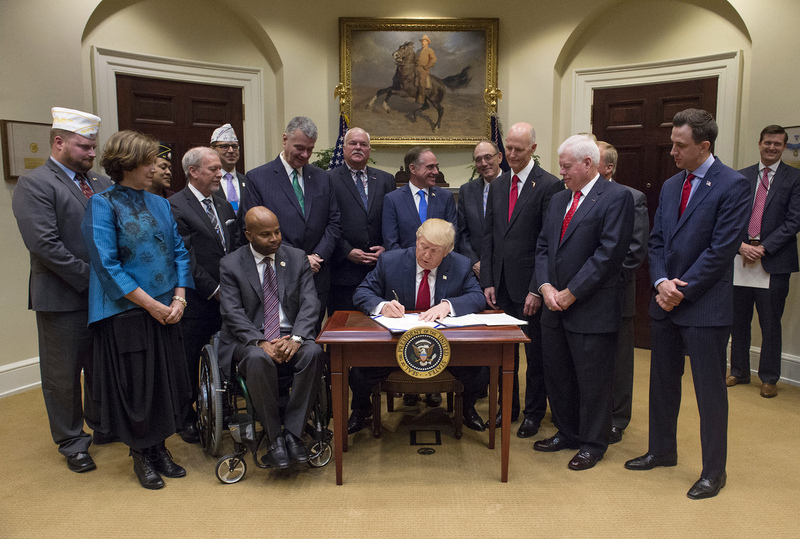 President Donald Trump signs the Veterans Choice Program Extension and Improvement Act at the White House on Wednesday. It's a fix that hasn't fixed much, but the troubled Veterans Choice program has been extended anyway. On Wednesday, President Donald Trump signed a bill extending the program intended to speed veterans' access to health care beyond its original August end point. Veterans Choice is a $10 billion response to the 2014 scandal in which Veterans Affairs health facilities altered records to hide months-long waits for care in Phoenix and elsewhere. The Choice program pays for private-sector health care for veterans and was set to expire in August, but the VA and some of the program's harshest critics in Congress have agreed to extend it, with a few changes, until January. They said that will give the VA time to propose a more comprehensive package of reforms — fixes for the fix. Sen. Jon Tester, D-Mont., authored the extension bill, which won bipartisan support in the House and Senate. Veterans Choice is designed to allow veterans who have waited more than 30 days for an appointment at a VA facility, or who live more than 40 miles from one, instead to get care from private providers who then bill the VA. But it has been plagued with problems. Many vets complain that Choice actually makes getting care more difficult and time-consuming, and some health care providers have dropped out due to slow payments or administrative hassles. The bigger reforms the VA wants to make following this extension bill will be aimed at fixing more than a half-dozen other systems the VA has for purchasing care from the private sector. "The idea of having seven, eight ways of doing the same thing is part of the problem, because it's confusing to veterans, it's confusing to the community providers," VA Deputy Undersecretary Dr. Baligh Yehia said last year. Yehia says the VA has issued a request for proposals to streamline how it buys care from non-VA providers across the board. It expects to receive those proposals this summer. Tester, the ranking Democrat on the Senate Veterans' Affairs committee, says he hopes to have draft legislation incorporating private-sector reform proposals ready in the fall. Tester says his goal is to "cut the red tape and make sure it's easy to work with for the providers. And I think we'll get more providers jumping on board, and we'll get more veterans using it, if the time to set up those appointments is reduced dramatically." Tester says he'll defend the VA from those who "don't want the government involved in health care at all." "I think it's idealism versus realism," Tester says. "We have folks that have borne the wounds of battle, and I think the VA is best suited to take care of those folks. So that VA needs to be there, and then we need to have a private sector that fills in the gaps around that VA."
That's particularly important in rural states like Tester's Montana, where VA facilities are an important part of a generally understaffed health care landscape. They provide vital services, but rely on partnerships with private-sector doctors, clinics and hospitals to provide specialty care, or appointments that don't require hours of driving.